This past year has brought me some very unusual stories about the Battle of Lake Erie Bicentennial from even stranger sources. Such is the case of one Hezekiah H. Gear, a very successful lead mine entrepreneur from Galena Illinois. Last fall when a group of visiting Road Scholars (formerly Elder Hostile) was in town bird watching, I was talking to one of the scholars. This fellow told me that they had recently been on a trip to Galena Illinois and seen “Commodore Perry’s Battle Flag” from the Battle of Lake Erie on display at the Galena-Jo Daviess Historical Society & Museum. First you might wonder like I did, “Where the heck is Galena?” Well Galena is in the most northwestern part of Illinois just a few miles east of the Mississippi River and just south of the state of Wisconsin. It was barely an encampment on the river at the time of the Battle of Lake Erie. It later became a town of some prominence on the shoulders of the many lead veins that were discovered and subsequently mined in the surrounding area in the mid to late 1820’s. Today It is a beautiful serene “New Englandesque” town and certainly worth visiting (www.visitgalena.org). Our part of the story centers round Hezekiah H. Gear, oldest of 8 children born in Connecticut in 1791. The version that has been told about young Hezekiah is that he enlisted into the Massachusetts Militia at about the age of 19 or 20 for a very short stint that may have included being in or assigned to the US Navy. We have no documentation that Gear was ever aboard the Lawrence or any of the ships used in the Battle of Lake Erie. Not in the Captain or pursers log or even in any historical retellings of that fateful day. But like many stories from this period in history it has been retold and perhaps embellished over time. By many “post war” published accounts I received from the Galena-Jo Davies Historical Society, Hezekiah was aboard the Brig Lawrence with Commodore Perry during the Battle of Lake Erie. As the ship and crew became overwhelmed by enemy fire, most of the crew dead or mortally injured, Commodore Perry prepared to move his command to the Niagara. Just as he was about to depart, young Hezekiah bravely turned back to fetch the captain’s “ensign”. In this case a hand-sewn American flag with fourteen (and later seventeen) randomly placed stars and nine red and white stripes. Often this type of “Captain’s” burgee or ensign was flown on board when the commanding officer was present and had great sentimental value for its owner. According to an account in the Galena Museum about the flag, written by Curator Daryl Watson, Gear was a hero. He wrote, “Amid a hail of enemy fire, he frantically climbed the rigging and snatched the flag. Dropping back to the deck, he raced to Perry’s side, where the young Captain wrapped the tattered cloth over his arm as the abandoned ship”. Supposedly, soon after the battle, safe on the shores of Put-in-Bay Commodore Perry presented the tattered flag to Hezekiah for his bravery. Some accounts have this actually taking place years later and not by Perry at all. Never the less, he kept the cherished flag in his personal affects and the legend of the flag traveled with Gear. Young Hezekiah Gear went west 1827 after the war filing a claim for land that might be mined for lead. Both the Native Americans and the US Government disputed the land’s ownership. Both believed it was theirs through a treaty. After much court wrangling and even a short stint in jail Gear prevailed and was awarded clear title. The land was very fruitful and Gear became “one of Galena’s most prosperous and philanthropic citizens. He became an Illinois State Senator and commander of the Illinois “Young America” Militia. Today the ensign remains on display at Galena-Jo Daviess Historical Society Museum, though its provenance is now unclear. It has traveled to other museums at times as part of War of 1812 exhibit adding to its lore. The real story of the flag remains a bit murky but the story provides a “great and glorious” picture of the times. What we know for certain is that Gear spent a very short time in the Massachusetts Militia, though in 1871 he was declared eligible for a pension. Before he died in 1877 Hezekiah transferred ownership of the flag to the Customs House near Galena under the watchful eye of the “Young America” and “Wide Awake” guards. In a short address to “Young America” Hezekiah Gear kept the legend of the flag aloft evoking Perry’s bravery in his address “long may it wave over your heads and may the same Almighty Being that shielded the brave Perry and gave him victory in defense of your country and your countries cause”. He closed his speech with those immortal words “we have met the enemy and they are ours.” As Napoleon Bonaparte once said “history is written by the victors”. By the end of November 1812, as the war with the British staggered on, our 4th US president, James Madison, had been re-elected. The American fleet and our militia had suffered numerous defeats to British and Canadian forces. To make matters worse several strategic ports in South Carolina and Georgia were being successfully blockaded by the British Fleet. 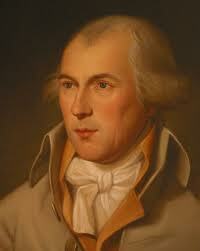 By December of 1812 Madison’s Secretary of War, William Eustis, was forced to resign in disgrace. I am certain that news of the various American Fleet setbacks reached very patriotic Perry and motivated him to finally end his extended honeymoon and ask for a return to active duty. 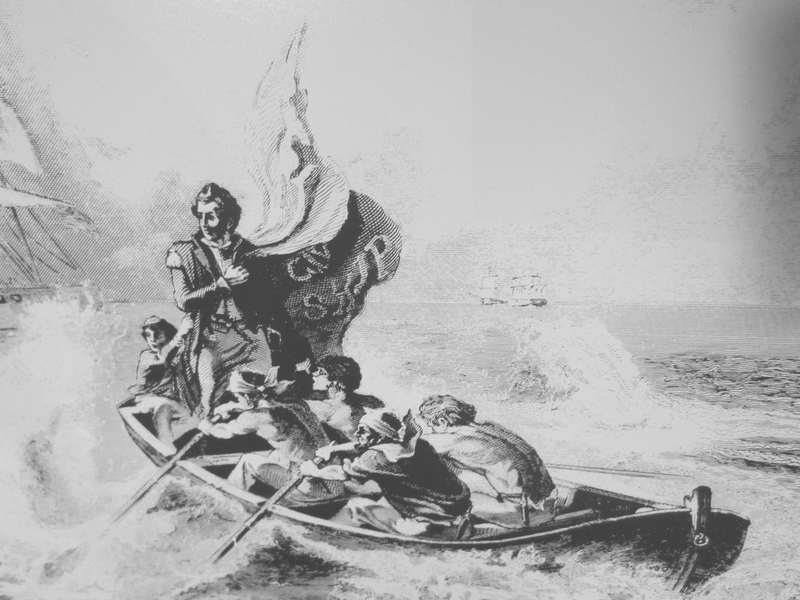 In March of 1813 Perry was given his new command and he was sent to Presque Isle to build a fleet to challenge the British control of Lake Erie. And as we know that important decision changed the course of US history. The summer of 2012 was the start of a three-year observance of the War of 1812 and especially the Battle of Lake Erie. For us this was a chance to create a buzz for things to come. Here in Put-in-Bay our summer of 2012 was one of great hope and success. The National Park Service staff got things rolling here on the island in June with the “Declaration of War” observance. Shortly after that the Perry Group got underway with building Commodore Perry’s iconic “Long Boat”. 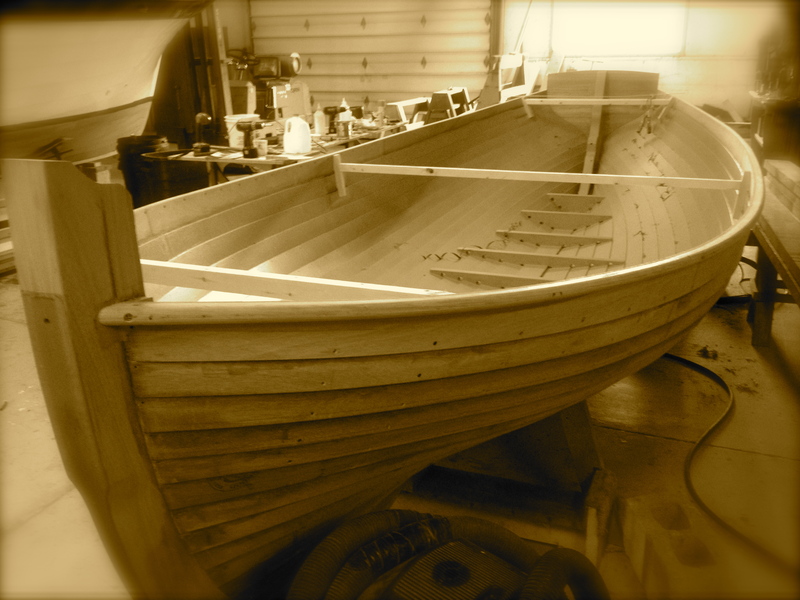 The longboat, which is now fully planked, is slowly working it’s way through the final stages of its’ completion. On August 30th beautiful weather made the excursion from Put-in-bay to Cleveland’s Navy week a huge success. The “transfer of command” from The Brig Niagara to Perry Class Frigate USS DeWert capped off the day’s festivities at the Navy’s kick off event for the Battle of Lake Erie Celebration. The summer ended with Historic Weekend hosted by Perry’s Victory and International Peace Memorial, and included re-enactors, carronades, marching bands and parades. Historic weekend would not be complete without music and included an outstanding performance by the Toledo Symphony. Saturday evening ended with the “Lights of Peace” Harbor Illumination. On Sunday morning a solemn ceremony was held at the placement of the permanent “Battle of Lake Erie” buoy by the US Coast Guard at the battle site. The upcoming 2013 Battle of Lake Erie Bicentennial celebration planning is well underway. 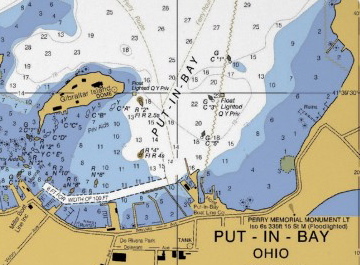 The Perry Group and the National Park Service are preparing for a summer of memorable events here in Put-in-Bay and the Western Basin of Lake Erie from August 30th through September 10th. We have 19 tall ships scheduled to make their way to our area next August 29th. Eleven ports have signed on to be hosts, including Put-in-Bay, Middle Bass Island, Kelley’s Island, Pelee Island, Catawba Island, Port Clinton, Monroe, Windsor, Leamington, Kingsville, and Amherstburg. Perry’s Victory and International Peace Memorial, The Perry Group and the eleven host ports cities will host Twelve days of activities, both on the water and on land. But we can’t rest yet. Get out your calendars, because on Martin Luther King weekend January 17-21st, the Lake Erie Maritime Association has invited The Perry Group along with the NPS to host a weekend Battle of Lake Erie Celebration preview at the Cleveland Boat Show. We will have the newly completed Perry’s Longboat on site, re-enactors, authors and period musical performers gathered together to help raise the awareness level of our 2013 roster of summer’s event one more notch. Stay tuned! If we remember just one thing about the War of 1812 from grade school hopefully it is that Francis Scott Key wrote the Star Spangled Banner, actually just the lyrics, in the form of a poem called “The Defense of Fort McHenry”. So while Fort McHenry was being bombarded by British Royal Navy ships in the Chesapeake in 1814, Key penned what would be come our most identifiable American song. (Ironically the tune for the national anthem would come from a British Social Club song called “”To Anacreon in Heaven”.) It was several years later before the lyrics he scrawled on the back of an envelope would become an anthem and it was not until 1931 when Herbert Hoover declared it our national anthem. Today every school kid in America should know the stirring words “And the rockets red glare, bombs bursting in air, gave proof through the night that our flag was still there”. To me, Key’s lyrics evoke an image of survival, perseverance and an emotional victory that in many ways reminds us of the second most notable event of the war (my opinion), Perry’s transfer of command from the Lawrence to the Niagara with his iconic flag. If just one idea lingers in our memory after this Battle of Lake Erie Bicentennial is over it has to be “Don’t Give Up the Ship”. 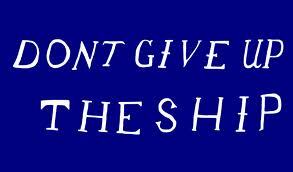 This slogan and flag is Commodore Perry’s most important contribution to our collective historic consciousness. Perry’s flag story in simplest terms… Oliver Hazard Perry was a young, smart, impressionable sailor from Rhode Island, from a family of brave sailors. Oliver went off to serve his country filled with patriotism and guile for the British. He was aboard the USS Chesapeake when his commanding officer, Captain James Lawrence, was mortally wounded during a confrontation with the British ship “HMS Shannon”. Young Perry was influenced and guided by his service with Lawrence. 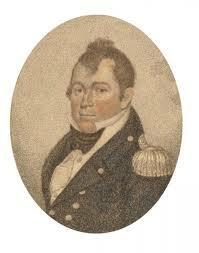 As Lawrence lay dying he implored young Perry to not give up the ship. Perry was so moved by the moment soon after he went and had a personal flag with “Don’t Give up the Ship” made which he carried with him into battle on several occasions and most notably during the Battle of Lake Erie. We may not remember or even know the back-story that propelled Perry to create his flag or carry it with him into battle, but I can tell you first hand that maritime gift shops from Boston to Put-in-Bay, Virginia to San Diego have “DGUTS” flags for sale. Many of the shop owners and clerks may be challenged to explain where the slogan came from exactly, but there is no other more important and identifiable Naval slogan today that I know of. Like so many stories that make up the fabric of our national history, they become just fragments of a larger story that survives to become part of our collective American memory. And because the US Navy uses, promotes and displays the “DGUTS” flag, and the slogan is prominently featured throughout our country’s Naval Bases, ships and recruiting stations, we see it and recognize its’ importance. It rings true not just for our Navy, but for all boaters and patriots I believe. In late August, Navy week comes to the Cleveland waterfront to commemorate the War of 1812. And so in the late afternoon of Thursday August 30th one of Commodore Perry’s direct descendants will be aboard the longboat we have built to ceremonially recreate that iconic transfer of command. As the longboat embarks on a short journey across the harbor from the Brig Niagara to the USS De Wert, it symbolically connects us to this important moment in time, the afternoon of September 10th, 1813 when Oliver Hazard Perry changed the outcome of the war and American history. Hopefully thousands will be on hand as this important event unfolds. Perhaps providing the visual reference we so often need to understand the importance of great days in history and why the flag Perry created was such a big part of that moment. I look forward to that moment as we witness again that Oliver Hazard Perry’s flag “is still here”. Magazines, television and roadside billboards are awash with iconic images like the coke bottle, mart ini glass, Eiffel Tower, Einstein’s hair, Mickey Mouse “ears”, and the VW Beetle. But for many of us our passion for history takes us deeper into American imagery. The stopped tank in Tiananmen Square (1989), The plaintive woman in Kent State shooting photo (1970), and the raising of the American flag at Iwo Jimo (1945) are gripping memorable iconic images that resonate with us. Americans attach their own interpretation or meaning to these icons, for the “greatest generation” that photo from Iwo Jima stands for all that we fought so hard for in the Second World War. Before photojournalism, these iconic moments were captured by artists. For me Commodore Perry aboard a rowing gig transferring his command from the Brig Lawrence to the Brig Niagara during the Battle of Lake Erie is one of these powerful iconic American scenes, the most famous painted by Ohio artist William Henry Powell in 1857. The scene has been painted repeatedly and it is “the image” that we attach to the Navy’s most steadfast motto, “Don’t give up the ship”. And while Perry is not the originator of that slogan, his love for his fallen friend James Lawrence, commander of the “Chesapeake”, propelled him to create the “DGUTS” flag that has made it one of our most well known historical American folklore images. Surprisingly, today the “DGUTS” flag image stands alone from the Battle of Lake Erie. For many Americans the slogan, the flag, even the painting are not necessarily attached to the heroic events that made Perry’s success in the Battle of Lake Erie become legendary in his own day. There are dozens of versions of this iconic scene. From the black and white lithograph from Yale’s collection to the most famous Powell version that adorns the rotunda outside the halls of congress. When you see the painting of Commodore Perry being rowed from the Lawrence to the Niagara it is easy to identify immediately with the “never say die” outside the box thinking that made Perry an enshrined hero of the early American Republic. About a year ago, The Perry Group had a notion that maybe this iconic image, this moment in time, could be recreated. What if we could build a replica of the rowing gig that Perry used to transfer his command and make it a part of the celebration for the Battle of Lake Erie bicentennial? We started to research these paintings to identify the type of boat he might of used. Since no one made sketches of the battle that September day in 1813, artistic license was employed in the various depictions. Some of these paintings have as few as 6 men aboard, while others have as many as 10. Some show Perry carrying the “DGUTS” flag, others have the American Colors flying from the bow. One thing we can be fairly certain about, when Perry was being rowed to the Niagara the battle was still raging all about him. He probably did not have many able bodied men left after the Lawrence had been pummeled practically into splinters. I would also bet he did not want to draw overt attention to himself. Never the less the image we hold dear today is what we are after, but as historically correct as possible. I can’t believe how lucky we are to have the opportunity to build one or our regions, perhaps the country’s most iconic historical Navy symbols. 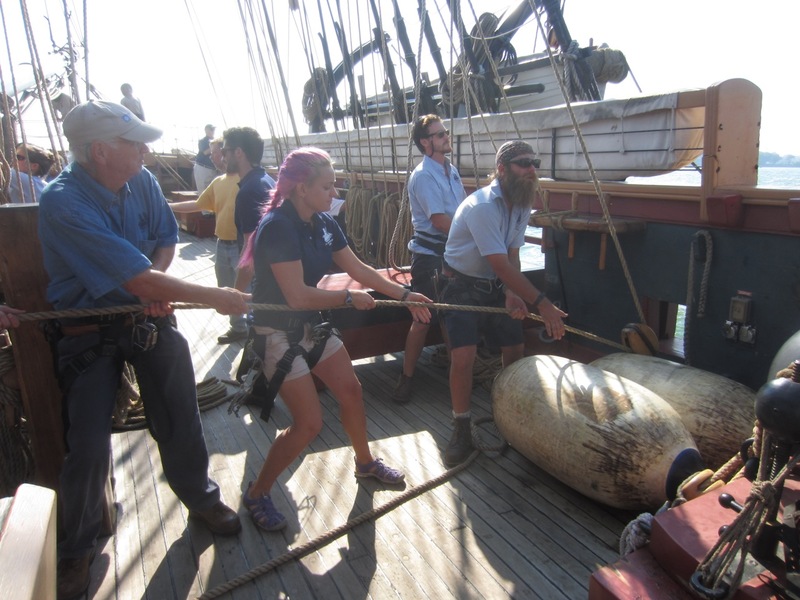 Our journey to find out more about this infamous boat, took us to Boston, Burlington (VT), Newport (RI) and Erie. We enlisted the expert eye of Bob Reynolds Grandson of Scott Matthews (Matthews Boat Company) to help us in this quest. At first we were just looking for what appeared to be similar. The long boat, pilot gig, and jolly boat are all rowing vessels of the time period that came in various sizes and lengths. Some were designed for speed, others for carrying supplies, still others were for getting crew to and from shore. Since no one can be sure of what exact rowing gig had been aboard the Lawrence we started to research various styles that were common to the British fleet in those days. On our fact-finding trip to the Erie Maritime Museum we interviewed Walter Rybka, current captain of the Niagara and naval historian. Walter set us on a quest to find an 18’6” six man rowing gig based on lines he shared with us from the Brig Grampus. That was the turning point in our search. After returning from Erie, Bob found a copy of the plans that had been drawn up for the construction of the Brig Niagara, which was “rebuilt” in the 1980’s. It turned out that the naval architect in charge of that reconstruction was Melbourne Smith from Annapolis area. He had done considerable research before drawing those plans. His research included a gig that would have been aboard the Niagara. We contacted him and he has been helping us to create a final plan for our new gig. This ongoing process will begin next month. Construction will be carried out by Riddle Boat Works of Vermilion, with the help of the Sandusky Maritime Museum and Bob Reynolds. We have only just begun to recreate an icon. We have secured a challenge matching grant to get started but we still need funds and materials to build this iconic craft. But I promise you will see it with your own eyes this year, in all its glory once again on the lake once again. Get involved, follow this amazing quest on our blog site “Chasing Perry’s Victory” (https://chasingperry.wordpress.com/) or on twitter @theperrygroup.